Firstly, have you considered putting a nest box inside a building? There are lots of reasons why nestboxes in buildings are better than boxes on poles. They are far cheaper too! Barn Owl nest boxes in the UK should be placed in open countryside (avoid urban, suburban, heavily forested and high mountain areas). Sites within 1 km of a motorway or other fast unscreened main roads should be avoided due to the risk of road deaths. 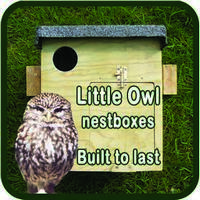 Nestboxes do not need to be placed on patches or strips of rough grassland as the birds are perfectly capable of ‘commuting’ across unsuitable habitats before starting to hunt and have very large home ranges. Check to see if your local landscape is suitable. Pole boxes are usually erected where there are no suitable buildings or trees, like here on The Fens. Obtaining and erecting a suitable pole. Plans for building a Barn Owl pole box. Erecting a pole-mounted exterior nest box. Human access and cleaning out. Criteria to use when assessing other designs of Barn Owl polebox. Most electricity or telegraph poles are suitable (provided there are no cables attached!). Minimum length 6 metres. Minimum diameter 150mm. Erection normally requires specialist machinery or a digger. Bury 1.5 metres in the ground leaving a height of 4.5 metres. Wherever possible the box should be secured to the pole before erection. The position in relation to habitat features is not critical but ensure that the main entrance hole is not screened by a building or tree(s). The dimensions given in the plans below must be treated as the minimum size. An ideal nest box for Barn Owls would be much bigger than the one described on this page: a full 1 metre from the bottom of the entrance hole to the bottom of the box and with a floor area of at least 1 metre x 1 metre. However, boxes that big would be very difficult to erect(!) and more expensive to build. 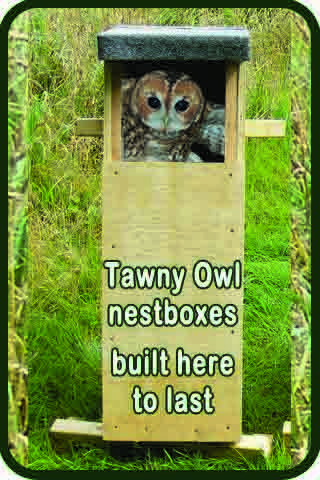 Barn Owl nestbox designs are a compromise between what is ideal for the birds and what is practical to erect. 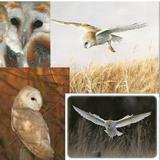 Have a look at our photo guide – how to build a Barn Owl polebox. Our deep nest box design is very safe for owlets due to a 60cm drop from the entrance hole to the bottom and an exercise platform with a raised edge. 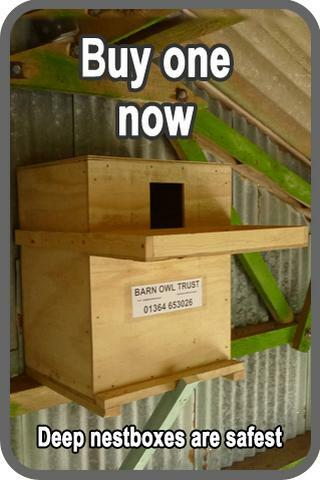 If you wish to vary from this owl box diagram, please check our essential criteria for interior Barn Owl boxes. The basic owl box should be built using rot-resistant or Tanalith E treated sheet material manufactured using a waterproof adhesive. 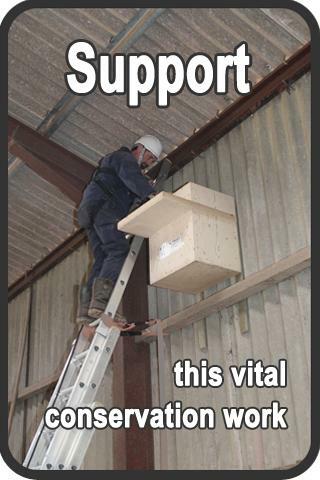 The Barn Owl Trust uses 12 mm tanalised softwood ply, 25 x 50mm and 50 x 50mm tanalised batten with 40mm and 50mm rust-resistant screws. Please avoid using hardwood ply, unless it is stamped “FSC Approved”. Where tanalised plywood is not available any type of preservative may be used provided that the box is dry before erection. It is essential that the edges and ends of all parts are treated before assembly. The top of the box should be covered with heavy duty roofing felt. A waterproof sealant (such as Ever-Build Weather-Mate) should be used in all the wood joints to prevent water seeping in. If you need proof that this is necessary, try leaving your pole box under a sprinkler for a few hours. 20mm diameter drainage holes can also be drilled in the floor of the box. The front, back and sides must overhang the floor of the box. The easiest way to put up a polebox is by machine. See our photoguide to erecting a Barn Owl pole-mounted nest box by machine. Alternatively, if you have no machine available, see our photoguide to erecting a Barn Owl pole-mounted nest box by hand. 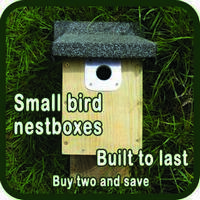 The front of the box should have an access panel to enable nest debris to be cleared out periodically. The internal depth of the box is important as it reduces the chances of a nestling Barn Owl falling from the box and dying as a result of neglect or predation. Therefore it is important that the box depth is maintained by clearing out the box once it has more than roughly 75mm of nest debris. If Jackdaws use the box it must be cleaned out every year (wear gloves and a dust mask). 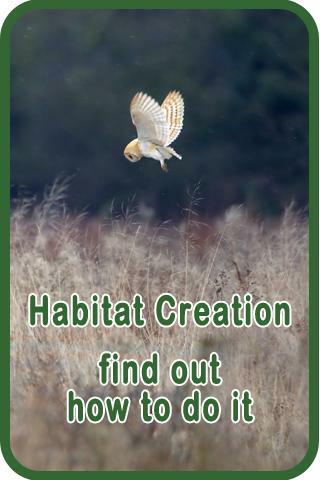 Boxes only used by breeding Barn Owls will need clearing out every 2 or 3 years at most. Under the Wildlife and Countryside Act 1981, it is an offence to disturb breeding Barn Owls so November to January is usually the best time. Before erecting a box, please ensure that you have properly assessed the risks involved, particularly with regard to working at height. Poleboxes are generally too heavy to lift single-handed and using a ladder is potentially dangerous. Please do not work alone and consider using multiple ladders or safer methods. Ideally, your polebox should be attached before the pole is erected. 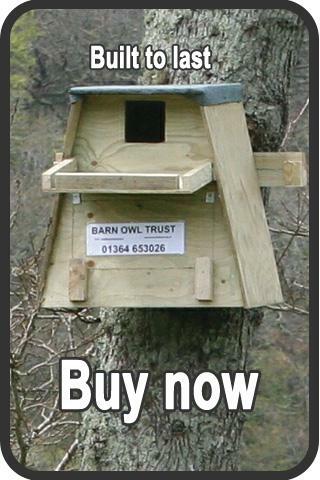 The Barn Owl Trust has used an erection method requiring three people and three ladders but this cannot be unreservedly recommended. The most important thing when erecting the box is your own safety (for which you are responsible). 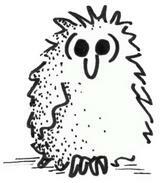 Avoid poor nest box design – which can be fatal to owlets. Entrance hole size: Optimum 100 x 130mm; min. 100 x 100mm; max. 150 x 150mm. Floor area of nest chamber: Good size range 0.3 to 0.4 m2. (e.g. 600 x 600mm). Absolute minimum 0.2m2. Depth from bottom of entrance hole to nest floor must be not less than 540mm. There must be an external platform below the entrance hole that allows ample room for an entire brood of young birds to exercise and await food deliveries; minimising the danger of young birds falling before fledging. External platform size should be at least 0.125 m2. The platform must have a raised edge high enough for Barn Owls to grip easily. Interior must remain dry during prolonged heavy rain coming from any direction. The platform should be positioned, and have sufficient shelter and drainage, to prevent rainwater getting into the nest box entrance. There should be enough height difference between the nest and the external platform to prevent the accumulation of a continuous (internal/external) layer of pellet debris allowing rainwater to soak through to the inside thereby chilling the nest contents. All sides should overhang the floor which needs adequate drainage. The installation of a (drier) false floor can be an advantage. Roof should be covered in thick roofing felt guaranteed for not less than 10 years, applied by heat or adhesive (not nailed or pierced in any way). Very steeply sloping roofs may not need covering but any apex join must be permanently waterproofed. A flat or slightly sloping roof that provides additional exercise space for the young is advantageous. Human access for easy clearing-out of nest debris is essential. Timber liable to decay within 20 years must be treated with long-lasting preservative: either pressure treated (e.g. Tanalith E) or surface treated including all edges of all component parts. Plywood used must be manufactured using a waterproof adhesive. All screws/nails and any metal fittings used should be rust proof. Should be substantially constructed yet light enough to permit safe erection using normal lifting equipment. Normal polebox weight range is 18-30kg. Any polebox under 13kg is probably not substantial enough. Should not be constructed from tropical hardwood unless the timber is FSC certified as sustainably grown. Within the box, a separate entrance hole into a small compartment so as to provide a secluded roosting space for an adult owl can be advantageous. (However, it should be designed so as to minimise the chances of this inferior cavity being used for nesting by Barn Owls). Measures aimed at reducing the chances of entry by other species (such as Jackdaws) are to be encouraged provided that they do not significantly reduce the box’s suitability for Barn Owls. In mainland Europe, entry by Beech Martens may be prevented by positioning the pole away from buildings or trees and by wrapping a 1.5 metre section of the pole with thin aluminium or other very slippery material. Boxes should be supplied with information that specifies an erection height of not less than 4 metres above ground level and stresses the importance of using a substantial pole of not less that 150mm diameter (normally 6 metres long, 1.5 metres underground and 4.5 metres in height). Information provided with poleboxes should also cover the following subjects: foraging habitat requirements, box positioning to maximise the chances of occupation (entrance hole visibility), the need for clearing out debris so as to maintain internal depth, box erection and attachment methods, and human safety issues. As a general rule, Barn Owl nestboxes should not be erected within 1km of any motorway, dual-carriageway or similar major road. We have a great range of cards and postcards, designed here, printed on recycled or FSC card, very reasonably priced and suitable for any occasion.